Days 3 and 4 – Wed 25 and Thu 26 Feb: After a storm bound day in La Corunna on the Tue; all were keen to get the exercise underway and some miles under the belt with the trip down to Bayone, a distance of approximately 120 miles. Immediately on ‘sticking our nose’ out of the harbour at 1000hrs, we were experiencing swell of 6 metres which wasn’t particularly helpful in getting all the crew adjusted with their sea legs on Day 1 sail. Seasickness was suffered by most very early on and several suffered quite badly throughout the whole passage. The wind was right on the nose for the leg up to Cape Veo which we had to tack up to to be able bear away to take us round Cape Finisterre. This was probably the hardest part of the leg; frustratingly beating to windward and most struggling with sickness. The original watch system planned was soon thrown out the window and watches adjusted to who was feeling capable at the time. 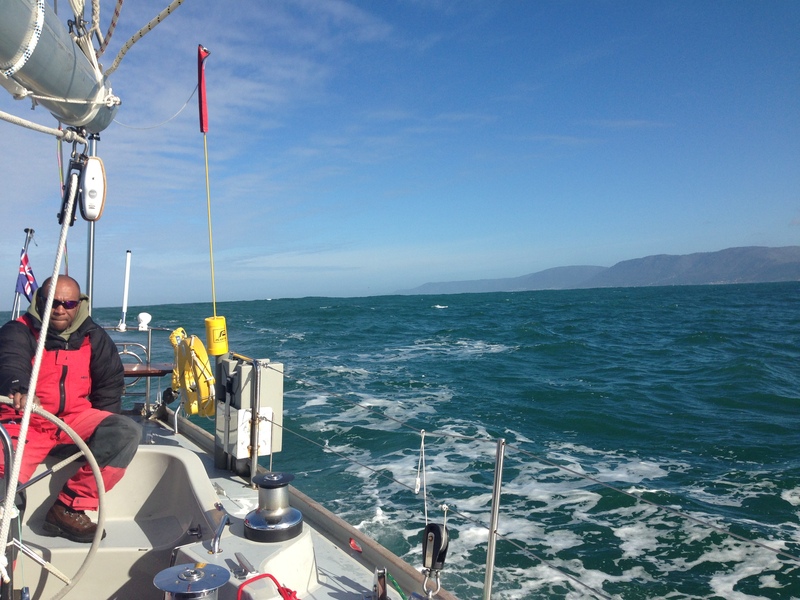 Once past Cape Finisterre, the wind kindly held WNW veering slightly later. The preventer was fitted and remained for a good broad reach into Bayone which was well received by all once alongside. Showers tested, the local yacht club facilities were both welcoming and very comfortable. Day 5 – Fri 27th Feb: After making arrangements that morning to fly one of the crew back to UK for medical reasons, we set sail at approximately 0900hrs bound for Leixoes, a distance of 64 miles which promised to make a much more enjoyable day sail with winds coming from the north west. Light airs in the morning meant we had to motor sail but come the afternoon, the wind picked up nicely, gusting 20 knots and achieving the occasional 9 knots speed over ground under mainsail alone. Alongside Leixoes for 1800hrs, the immediate appearance of the marina looked slightly disappointing, further compounded when initially we were told there was no shore power due to damage to the pontoon sustained during recent high winds; however the friendly marina staff managed to fix the problem and phones were eagerly being charged. Day 6 and 7 – Sat 28th Feb and Sun 1st Mar: We were still lucky with the forecast for winds abaft the beam for the run down the coast to Cascais; a distance of 153 miles. Everyone was now fully acclimatised for the journey, slipping at approximately 0700hrs and watches set up of fours hours on four off. We had the engine on for the majority of the day until the wind started to pick up to a steady 12 knots; and even with a reef in the main and No 1 jib, we were making a good 6/7 nautical miles in the hour. A lovely night sail ensued and with the sun rising, we were only 10 miles from Cascais. Stu Southwick has been a regular visitor to this marina so with his very positive description of the location; all were looking forward to the arrival. Whilst waiting on the reception pontoon to book in we chatted to a 62ft Contest yacht in front of us on a delivery trip with two Dutch sailors; one of them turned out to have done his Offshore assessment at Joint Services in 1992 on a Nicholson 55, whilst serving in the Dutch Army and being on a exchange visit with the Royal Marines. All his memories came flooding back after his tour of Kukri. Day 8 – Mon 2nd Mar: After spending most of the previous day catching up on sleep and jobs on Kukri, the day was spent relaxing in Cascais with it’s excellent marina facilities; especially the Skipper bar from where this blog was written! Four of the crew even took the short journey by train into the capital Lisbon.